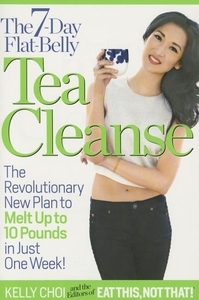 7-day Flat-belly Tea Cleanse : The Revolutionary New Plan to Melt Up to 10 Pounds of Fat in Just One Week! Imagine losing up to 10 pounds in one week simply by enjoying your favorite foods with a delicious cup of tea! It sounds almost too good to be true, but Japanese researchers have found that special antioxidants called polyphenols found in certain teas inhibit the body's ability to absorb fat by as much as 20 percent. What's more, in a 10-year study of over 1,000 people, those who regularly drank black, green, or oolong tea had nearly 20 percent less body fat than those who drank none.